Can row 2 all be made mandatory? The problem is that not ALL the different headings must be filled out. If I understood you correctly did you mean that you wanted to only place a requirement within the second row? Yes... row 2 mandatory in each box in that row. Perfect. The other rows can be optional. OR even better... 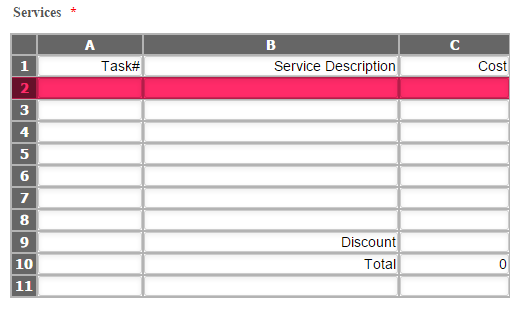 IF someone adds something to the C row (cost) then they must also fill in the other two columns in that row. Is that possible? Also, we tested a total and the total auto came up to 39.9995 (or something like that) when two numbers were added that only went to two decimals. Unfortunately, I'm unable to make a solution for that, it seems that it's not in the settings of the "Spreadsheet Widget" and a custom CSS to make the specific cell/row required seems not to work here. I'll ask my colleague KadeJM if the above screenshot is a working workaround for him.